When you purchase a Canadian Tire Gift Card in Rexall PharmaPlus (Ontario), you will get 10% off. This is a great offer, and you can use your credit card to buy the gift card. 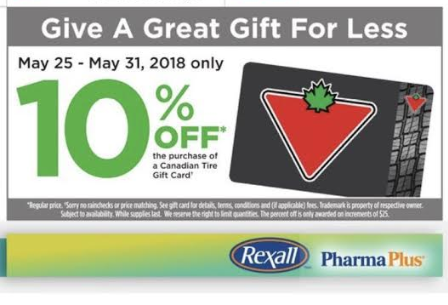 If you live in other provinces, please check the Rexall PharmaPlus flyer in your location, YMMV.